Chillingo Ltd, Europe's premier iPhone publisher has teamed up with French based DotEmu - the leading technology provider for emulation-based projects to deliver a literally ground 'breaking' retro classic for the iPhone and iPod Touch - Krypton Egg. Krypton Egg has been flagged by many retro enthusiasts as the ultimate breakout game - a hugely successfully title from the 90's. Officially licensed by DotEmu, Krypton Egg was described as the best Breakout game in the world by the French magazine PC Loisirs when it first came out in 1989. In its reincarnation on the iPhone, the entire user interface has been fully re-engineered to take advantage of the Touch Screen and Accelerometer features of the device. "Krypton Egg is bigger and better than it ever was - Krypton Egg on the iPhone definitely takes retro classics of this genre to an entirely new and different level." said Chillingo Director Chris Byatte. Unlike other breakout clones where the player only needs to bounce a single ball to destroy bricks, Krypton Egg takes it a few more notches upwards by introducing dozens of balls as the game progresses, including additions of many creative power-ups all over the screen. 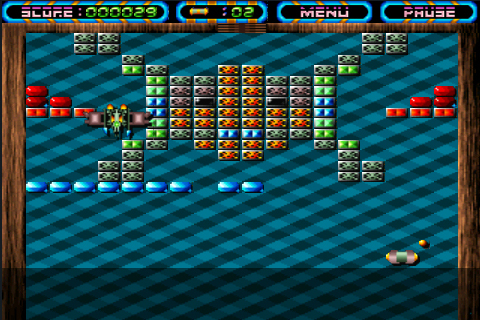 During bonus levels, Krypton Egg even turns into a Shooting style mode providing the player with the challenge to defeat hordes of enemies and bosses. With 60 levels +12 bonus levels and 30 power-ups Krypton Egg will definitely keep the gamer hooked from the beginning to the end. "The iPhone is a great platform for games. Krypton Egg is our second retro offering to the iPhone, a worthy successor after our retro platfomer, Nicky Boom which was launched over Christmas last year. We look forward to bringing more classic retro games back to live on this gaming platform of the 21st century." said Xavier Liard, co-founder and CEO of DotEmu. Krypton Egg is priced at an introductory price of USD0.99 and is available now through Apple's App store. Chillingo Ltd is a privately owned company in United Kingdom. Chillingo is the premier iPhone publisher in Europe for innovative games and software for the iPhone. DotEmu is a leading technology provider for emulation based projects giving new life to old video games on today's devices: Internet, Smartphones and PC.